Back in 2002, The Ring offered a US adaptation of a 1998 horror film. It did very well, as the remade Ring nabbed almost $250 million worldwide, about five times its budget. This spawned the inevitable sequel: 2005’s The Ring Two. Though less successful, the second flick still snared $161 million worldwide, which meant it probably turned a minor profit off of its $50 million budget. And then nothing, as the series sat dormant for 12 years. Horror franchises usually churn out sequel after sequel, but for reasons unknown, The Ring faded after only two films. A third movie finally hit in 2017 via Rings. At the film’s start, we get a refresher about the basic premise: the existence of a “cursed” videotape that leads to the demise of anyone who watches it. The viewers will go kersplat within seven days of that screening, all at the supernatural hands of the ghostly Samara Morgan (Bonnie Morgan). After a quick example of Samara’s deadly power, we meet Holt (Alex Roe), a young man who heads off to college. His girlfriend Julia (Matilda Lutz) becomes concerned when he goes AWOL and she soon learns why he fell out of touch. Holt’s professor Gabriel Brown (Johnny Galecki) stumbled upon Samara’s video, and this leads those men and others into its web. Julia attempts to battle back against the curse, a challenge that becomes more and more difficult due to the nature of modern technology. After nearly 20 years on this site and more than 6000 reviews, my mind occasionally slips. Usually this means I forget I ever watched certain movies – I’ll only realize that I saw something when I look up one of my reviews. In the case of The Ring, the opposite occurred: I believed I’d seen and written up that movie, but this never happened. Maybe I confused The Ring with The Grudge, another early 21st century horror franchise based on a Japanese film. Whatever the case, Rings became my introduction to the series. Now that I’ve seen it, I’m tempted to go back and give the 2002 version a look. That’s not because I liked Rings, however. No, I’m intrigued by the 2002 Ring because I want to see what all the fuss was about – the first film got good reviews, so it must be a much stronger experience than the tepid, silly Rings. I hate to offer redundant comments, but when I review modern horror, I often reflect on the same cinematic tendencies. Far too many 21st century fright flicks rely on little more than cheap jolts and loud noises to provoke “terror”, and these techniques leave them as tedious and stale. Rings doesn’t need to fall into those traps, as its extension of the original story offers potential. The use of the “cursed video” as a scientific experiment seems intriguing, and other choices give the film a shot at success. Unfortunately, the filmmakers submerge these possible positives underneath the weight of the usual tropes. 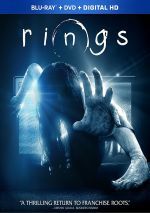 Rings comes with thin characters, a meandering plot and “scares” that come at us from a mile away. The film also boasts terrible acting from its leads. Lutz looks lovely but she can’t display any dramatic range at all, as she consistently comes across as wooden and stiff. When she attempts sadness or fright, Lutz just seems mildly miffed. On the other hand, Roe goes in the opposite direction and offers a pretty broad performance. He overdoes his scenes, as if he figures his over the top turn will compensate for Lutz’s flatness. This leads to a “fire and ice” combination that creates a weird inconsistency. Not that the greatest actors in the world could save the draggy tedium of Rings. Every once in a while, the movie threatens to come to life, but it quickly reverts to cheesy clichés and failed attempts at terror. Even devout Ring fans won’t find much to like in this failed sequel. Rings appears in an aspect ratio of approximately 1.85:1 on this Blu-ray Disc. This was a largely positive presentation. Overall sharpness looked fine, though exceptions occurred, as interiors could seem a bit soft. Still, most of the movie offered appealing delineation. I saw no signs of moiré effects or jagged edges, and neither edge haloes nor print flaws marred the proceedings. In terms of palette, Rings opted for a heavily teal affair. Some amber/orange came along for the ride, but a drab blue-green dominated. These colors were well-rendered given the film’s stylistic choices. Blacks looked fairly deep, though they could seem a bit thick at times, and shadows also offered mostly good imagery. Low light shots occasionally seemed slightly dense, but they were reasonably clear. This turned into a “B” presentation. I felt a bit more impressed by the film’s atmospheric DTS-HD MA 7.1 soundtrack. Though the mix emphasized creepy ambience, it still managed to come to life in a dynamic manner when necessary. This meant the soundscape used the various channels to create an involving setting. Various spooky elements popped up around the room and formed a nice sense of the action. Add a few bigger sequences – like a plane-based catastrophe – and this turned into an immersive auditory experience. Quality also worked well, with speech that consistently appeared natural and distinctive. Music showed warm, full tones, and effects seemed accurate and clear. Bass response worked really well, as the track featured deep low-end that contributed to the movie’s ominous vibe. I thought the soundtrack suited the material and added to the experience. A handful of extras fill out the set, and we start with Terror Comes Full Circle, a 12-minute, 37-second featurette. It provides notes from makeup effects designer Arjen Tuiten, production designer Kevin Kavanaugh, stunt coordinator Keith Campbell, and actors Johnny Galecki, Bonnie Morgan, Aimee Teegarden, Matilda Lutz, Alex Roe and Kayli Carter. “Circle” looks at story and characters, style and updates from the prior films, cast and performances, the director’s approach, sets and locations, and stunts. Most of this offers fluffy promotional fodder, so don’t expect to learn much about the production. Called Resurrecting the Dead, a second featurette runs nine minutes, 19 seconds and includes comments from Roe, Morgan, Tuiten and Galecki. “Dead” looks at the film’s depiction of Samara, with a focus on Morgan’s performance and makeup/effects. “Dead” becomes reasonably informative. Scary Scenes lasts six minutes, 35 seconds. It features Lutz, Roe, Galecki, Teegarden, Carter, and Morgan. The actors tell us their favorite moments in Rings. Yawn. 14 Deleted/Extended/Alternate Scenes take up a total of 18 minutes, 40 seconds. Of these 14, fans will probably find themselves most interested in the “Alternate Ending”, but they shouldn’t expect much from it. The “Alternate Ending” makes an implicit character development more explicit but doesn’t alter the finale in any other manner. As for the rest of the clips, they tend to offer expository information, some of which helps makes aspects of the story clearer. We get a better idea why Julia doesn’t go off to school with Holt as well as her family situation. These moments may have slowed down a movie that already runs a little too long, but they flesh out Julia pretty well. Others seem less interesting. We get a few more attempts at scares plus a smattering of attempts to develop the overall narrative. These fail to add much to the film. A second disc provides a DVD copy of Rings. It lacks any of the Blu-ray’s extras. After more than a decade, the Ring horror franchise returns with a thud. Rings shows a glimmer of potential but it fails to exploit its positive possibilities. The Blu-ray offers generally good picture along with involving audio and mediocre supplements. Rings delivers a flat, scare-free tale.